♥ People are often unreasonable, irrational and self-centred; forgive them anyway. ♥ If you are successful, you will win some unfaithful friends and some genuine enemies; succeed anyway. ♥ If you are honest and sincere, people may deceive you; be honest and sincere anyway. ♥ What you spend years creating, others could destroy overnight; create anyway. ♥ If you find serenity and happiness, some may be jealous; be happy anyway. ♥ The good you do today, will often be forgotten; do good anyway. ♥ Give the best you have, and it will never be enough; give your best anyway. ♥ In the final analysis, it is between you and God; it was never between you and them anyway. and to bask in the sun. Jesus is the Prostitute – to remove from danger. Jesus is my Everything. Amen. the evident fullness of the love our hearts bear to you. Amen. Immaculate Heart of Mary, cause of our joy: Pray for us. Holy Guardian Angels, be always with us, guide and protect us. Amen. Poorest of the Poor and had compassion on them, please help us. compassionate eyes and see Christ within (them/him/her). in the Holy Eucharist, and present our request. through you. 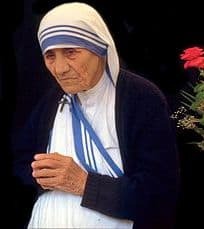 Kindly Mother Teresa, help us. Amen.